24V 100W 2500 RPM electric scooter motor. Powerful two brush permanent magnet design with 100% ball bearing construction. Includes 9 tooth sprocket for #25 chain. 12" long power leads with terminal connectors. Shaft rotation reversible by reversing power leads. Dimensions: 2-5/8" wide x 3-7/8" long excluding shaft, 4-7/8" long including shaft. Made by Unite®. 24V 100W 2500 RPM electric scooter motor. Powerful two brush permanent magnet design with 100% ball bearing construction. Includes 16 tooth belt cog for 3m pitch drive belts. 15" long power leads with terminal connectors. Shaft rotation reversible by reversing power leads. Dimensions: 2-5/8" wide x 3-1/2" long excluding shaft, 4-1/2" long including shaft. Made by Unite®. Compatibility: Razor E100 belt drive scooters plus other similar makes and models. 24V 150W 2500 RPM electric scooter motor. Powerful two brush permanent magnet design with 100% ball bearing construction. Includes 9-tooth chain sprocket. 19" long power leads with 1/4" wide female terminals. Shaft rotation reversible by reversing power leads. Dimensions: 2-3/4" wide x 4" long excluding shaft, 5-1/2" long including shaft. Made by Unite®. 24V 150W 2500 RPM electric scooter motor. Powerful two brush permanent magnet design with 100% ball bearing construction. Includes 19-tooth belt cog for 3mm drive belts. 12" long power leads with 1/4" wide terminals with pre-installed connector. Shaft rotation reversible by reversing power leads. Dimensions: 2-3/4" wide x 4" long excluding shaft, 5-1/2" long including shaft. Made by Unite®. 24V 200W 2750 RPM electric scooter motor. Powerful four brush permanent magnet design with 100% ball bearing construction. Includes 13 tooth drive belt cog for 5mm pitch drive belts. 17" long power leads. The shaft rotation is reversible by reversing power leads. Dimensions: 4" wide x 3-1/4" long excluding shaft, 4-1/4" long including shaft. Mounting bracket measures 4-3/8" x 2-1/4" with 4 threaded mounting holes. Weight 3.85 lbs. Made by Unite®. Compatibility: Razor E200 belt drive scooter plus many other similar makes and models. 24V 200W 2750 RPM electric scooter motor. Powerful four brush permanent magnet design with 100% ball bearing construction. Includes 11 tooth sprocket for #25 chain. 17" long power leads with 1/4" push-in connectors. Shaft rotation reversible by reversing power leads. Dimensions: 4" wide x 3" long excluding shaft, 4-1/4" long including shaft. Mounting bracket measures 4-3/8" x 2-1/4" with 4 threaded mounting holes. Weight 3.8 lbs. Made by Unite®. Compatibility: Razor E200 chain drive scooter plus other similar makes and models. 24V 250W 2650 RPM electric scooter motor. Powerful four brush permanent magnet design with 100% ball bearing construction. Includes 13 tooth drive belt cog for 5mm pitch drive belts. 12" long power leads with 1/4" push-in connectors. Shaft rotation reversible by reversing power leads. Dimensions: 4" wide x 3-1/4" long excluding shaft, 4-1/4" long including shaft. Mounting bracket measures 4-1/2" x 2-1/8 with 4 threaded mounting holes. Weight 4.3 lbs. Made by Unite®. Compatibility: Razor E300 belt drive scooter plus many other similar makes and models. 24V 250W 2500 RPM electric scooter motor. Includes 11 tooth sprocket for #25 chain. 12" long power leads with 1/4" push-in connectors. Shaft rotation reversible by reversing power leads. Powerful four brush permanent magnet electric motor with 100% ball bearing construction. Dimensions: 4" wide x 3-1/4" long excluding shaft, 4-1/4" long including shaft. Mounting bracket measures 4-1/2" x 2-1/8 with 4 threaded mounting holes. Weight 4.3 lbs. Made by Unite®. Compatibility: Razor Ground Force go kart and Razor Mini Chopper bike plus many other Chinese-made electric scooters and bikes. 24V 250W 2650 RPM electric scooter motor. Powerful four brush permanent magnet design with 100% ball bearing construction. Includes 11 tooth sprocket for #25 chain. 12" long power leads with 1/4" push-in connectors. Shaft rotation reversible by reversing power leads. Dimensions: 4" wide x 3-1/4" long excluding shaft, 4-1/4" long including shaft. Mounting bracket measures 4-1/2" x 2-1/8 with 4 threaded mounting holes. Weight 4.3 lbs. Made by Unite®. Compatibility: Razor E300 chain drive scooter plus many other scooter makes and models. 24V 250W 2500 RPM electric scooter motor. Powerful four brush permanent magnet design with 100% ball bearing construction. Includes 11 tooth sprocket for #25 chain. 17" long power leads with 1/4" push-in connectors. Shaft rotation reversible by reversing power leads. Dimensions: 4-1/8" wide x 3-1/8" long excluding shaft, 4-1/4" long including shaft. Mounting bracket measures 4-3/8" x 2-1/4 with 4 threaded mounting holes. Weight 4.25 lbs. Made by Unite®. Compatibility: Razor E300 Chain Drive Scooter plus many other similar makes and models. 24V 250W 2650 RPM electric scooter motor. Powerful four brush permanent magnet design with 100% ball bearing construction. Includes 11 tooth sprocket for #25 chain. 15" long power leads with 1/4" push-in connectors. Shaft rotation reversible by reversing power leads. Dimensions: 4" wide x 3-1/4" long excluding shaft, 4-1/4" long including shaft. Mounting bracket measures 4-1/4" x 2-1/8 with 4 threaded mounting holes. Weight 4.3 lbs. Made by Unite®. Compatibility: Razor MX350 version 9+ and Razor MX400 Version 1+. 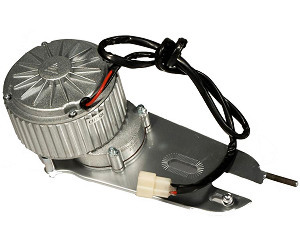 24V 250W electric bicycle motor with built-in gear reduction transmission. Output shaft speed 400 RPM. Includes 9 tooth sprocket for 1/2" x 1/8" bicycle chain. Different size fixed and freewheel sprockets are available for this motor. Output shaft is 11mm OD with a 4mm wide x 2mm deep keyway. Powerful four brush permanent magnet design. 100% ball bearing construction. 24" long power leads. Shaft rotation reversible by reversing power leads. Three bolts on front side of motor for mounting. Mounting bracket is available for this motor. Motor dimensions: 4-1/4" outside diameter x 2-3/4" long excluding transmission and output shaft, 4-1/2" long including transmission and output shaft. Made by Unite®. 24V 300W 2600 RPM electric scooter motor. Powerful four brush permanent magnet design with 100% ball bearing construction. 11 tooth sprocket for #25 chain. Shaft rotation spins clockwise if you are facing the shaft. Shaft rotation reversible by reversing power leads. 3 bolt mounting bracket measures 3-7/8" center to center distance between holes. Dimensions: 4"(H) x 4"(W) x 5-1/4"(L) including shaft. Weight 6 lbs. OEM Currie® motor. 24V 350W 2750 RPM electric scooter motor. Powerful four brush permanent magnet design with 100% ball bearing construction. 18" long power leads. 11 tooth sprocket for #25 chain. Shaft rotation reversible by reversing power leads. Mounting bracket measures 4-1/4" x 2-1/8" with 4 threaded mounting holes. Dimensions: 4"(H) x 4"(W) x 5-1/2"(L). Weight 5.2 lbs. Made by Unite®. Compatibility: Chinese-made electric scooters, electric dirt bikes, and electric pocket bikes. 24V 350W electric bicycle motor with built-in gear reduction transmission. Output shaft speed: 420 RPM. Includes 9 tooth sprocket for 1/2" x 1/8" bicycle chain. Different size fixed and freewheel sprockets are available for this motor. Powerful four brush permanent magnet design. 100% ball bearing construction. 22" long power leads. Shaft rotation reversible by reversing power leads. Three bolts on front side of motor for mounting. Mounting bracket dimensions: 4-3/8" long x 2-3/16" wide. Motor dimensions: 4-1/8" outside diameter x 4-5/8" long excluding transmission and output shaft, 5-3/8" long including transmission and output shaft. Weight 7.5 lbs. Made by Unite®. 24VDC 350W 2600 RPM electric scooter motor. Powerful four brush permanent magnet electric motor design with 100% ball bearing construction. 15 tooth freewheel sprocket for #25 chain. Shaft rotation spins counter clockwise if you are facing the shaft. 12" long power leads with connector at end. 3 bolt mounting bracket measures 3-7/8" center to center distance between holes. Dimensions: 4"(H) x 4"(W) x 5-1/4"(L) including shaft. Weight 6.1 lbs. OEM Currie® motor. 24V 400W 2600 RPM electric scooter motor. Powerful four brush permanent magnet design with 100% ball bearing construction. 11 tooth sprocket for #25 chain. Shaft rotation spins clockwise if you are facing the shaft. Shaft rotation reversible by reversing power leads. 3 bolt mounting bracket measures 3-7/8" center to center distance between holes. Dimensions: 4"(H) x 4"(W) x 5-1/4"(L) including shaft. Weight 6 lbs. OEM Currie® motor. 24V 400W 1950 RPM brushless electric scooter motor. Built-in variable speed controller works with 5k Ohm throttle or potentiometer to vary the speed of this motor from full stop to full forward. Clockwise shaft rotation facing the shaft (shaft rotation is not reversible). 1/2" OD output shaft with two flat spots at its end. Fits chain sprockets and belt pulleys with 1/2" ID bore. 3-bolt mounting pattern. Dimensions: 3-15/16"(H) x 3-15/16"(W) x 3-3/4"(L) not including the mounting tabs and including the shaft. Polished aluminum motor case. Manufacturer rated at 1/2 horsepower. Weight: 3.15 lbs. Made by MAC®. Wiring diagram and parts compatibility list. Built-in variable speed controller works with 5k Ohm throttle or potentiometer to vary the speed of motor from full stop to full forward. 2800 RPM at full speed. Counter clockwise shaft rotation facing shaft. 8mm OD D-shaped output shaft. 3-bolt mounting pattern. These are the same type of electric motors that Currie, Lashout, and USPD Pro-Drive electric bicycle kits use however they are not compatible with those bikes because they rotate counter clockwise instead of clockwise. These motors are popular with electric scooter and bicycle builders and experimenters. Weight 5.9 lbs. Wiring diagram, parts compatibility, spare parts. 24V 450W 2300 RPM electric scooter motor. Rated current: 28A. Powerful four brush permanent magnet design with 100% ball bearing construction. 11 tooth sprocket for #25 chain. Shaft rotation spins counter clockwise if you are facing the shaft. Shaft rotation reversible by reversing power leads. 25" long 12AWG power leads with connector at end. 3 bolt mounting face measures 3-7/8" center to center distance between holes. Dimensions: 4"(H) x 4"(W) x 5-1/4"(L) including shaft. Weight 6 lbs. OEM Currie® motor. 24V 450W 2400 RPM electric scooter motor. Rated current: DC24V 28A. Powerful four brush permanent magnet design with 100% ball bearing construction. 11 tooth sprocket for #25 chain. Shaft rotation spins clockwise if you are facing the shaft. Shaft rotation reversible by reversing power leads. 14" long 12AWG power leads with connector at end. Bottom mounting plate has 4 holes that measure 3-3/4" x 1-5/8 center to center distance between holes. Dimensions: 4-1/4"(H) x 4"(W) x 4-3/8"(L) including shaft and sprocket. Weight 6 lbs. OEM Currie® motor. 24V 450W electric bicycle motor with built-in gear reduction transmission. Output shaft speed 420 RPM. Includes 9 tooth sprocket for 1/2" x 1/8" bicycle chain. Different size fixed and freewheel sprockets are available for this motor. Output shaft is 11mm OD with a 4mm wide x 2mm deep keyway. Powerful four brush permanent magnet design. 100% ball bearing construction. 24" long power leads. Shaft rotation reversible by reversing power leads. Three bolts on front side of motor for mounting. Mounting bracket is available for this motor. Motor dimensions: 4-1/4" outside diameter x 3-1/2" long excluding transmission and output shaft, 4-1/2" long including transmission and output shaft. Made by Unite®. 24V 450W electric bicycle motor with built-in gear reduction transmission. Output shaft speed 470 RPM. Includes 9 tooth sprocket for 1/2" x 1/8" bicycle chain. Different size and freewheel sprockets are available for this motor. Output shaft is 11mm OD with a 4mm wide x 2mm deep keyway. Powerful four brush permanent magnet design. 100% ball bearing construction. 24" long power leads. Shaft rotation reversible by reversing power leads. Motor dimensions: 4-1/4" outside diameter x 3-1/2" long excluding transmission and output shaft, 4-1/2" long including transmission and output shaft. OEM Currie® motor. Although this motor looks identical to the Unite® gear motor sold above it is made by a different factory and is an OEM Currie® motor. The Unite gear motor sold above has smaller bolt hole threads than this motor does so eZip®, IZIP®, and Currie® motor mounting plate bolts will not fit the Unite® gear motor. 24V 450W electric bicycle motor with built-in gear reduction transmission. Output shaft speed 470 RPM. Includes 9 tooth sprocket for 1/2" x 1/8" bicycle chain. Different size sprockets are available for this motor. Output shaft is 11mm OD with a 4mm wide x 2mm deep keyway. Powerful four brush permanent magnet design. 100% ball bearing construction. 24" long power leads. Shaft rotation reversible by reversing power leads. Motor dimensions: 4-1/4" outside diameter x 3-1/2" long excluding transmission and output shaft, 4-1/2" long including transmission and output shaft. OEM Currie® motor. If you need to replace this motor and already have the motor mounting plate it can be easily transferred onto the motor sold above and you will save thirty bucks. 24V 450W electric bicycle, tricycle, and go kart motor with built-in spur gear reduction transmission. Output shaft speed 450 RPM. Includes 10 tooth sprocket for #40, #41, and #420 chain (all of these chain sizes work with this motor's sprocket). Different size sprockets are available for this motor. Powerful four brush permanent magnet design with 100% ball bearing construction. 24" long 12awg power leads. Shaft rotation reversible by reversing power leads. Mounting bracket measures 4-3/4" x 2-7/8" and has 4 holes that are spaced 4" x 2-1/4" apart. Motor dimensions: 4-1/4" outside diameter x 5-1/2" long excluding transmission and output shaft, 8-1/2" long including transmission and output shaft. Weight 11 lbs. Made by Unite®. 24V 450W electric bicycle, tricycle, and go kart motor with built-in planetary gear reduction transmission and cooling fan. Output shaft speed 560 RPM. Shaft diameter where sprocket seats into is 9mm x 13mm with a dual D-bore. Includes 10 tooth sprocket for #40, #41, and #420 chain (all of these chain sizes work with this motor's sprocket). Powerful four brush permanent magnet design with 100% ball bearing construction. 12 gauge power leads. Shaft rotation reversible by reversing power leads. Mounting bracket measures 5-1/2" x 4-1/2" with 4 mounting holes. Mounting holes are spaced 4" center to center across by 2-1/2" center to center across. Weight 17 lbs. Made by Unite®. 24V 500W 2600 RPM electric scooter motor. Powerful four brush permanent magnet design with 100% ball bearing construction. 11 tooth sprocket for #25 chain. 10mm OD shaft. Shaft rotation spins counter clockwise if you are facing the shaft. Shaft rotation is reversible by reversing power leads. 25" long power leads with connector at end. 3 bolt mounting bracket measures 3-7/8" center to center distance between holes. Dimensions: 4"(H) x 4"(W) x 4-5/16"(L) including shaft. Weight 5.5 lbs. OEM Currie® motor. 24VDC 500W 2600 RPM electric scooter motor. Powerful four brush permanent magnet electric motor design with 100% ball bearing construction. 15 tooth freewheel sprocket for #25 chain. Shaft rotation spins counter clockwise if you are facing the shaft. 12" long power leads with connector at end. 3 bolt mounting bracket measures 3-7/8" center to center distance between holes. Dimensions: 4"(H) x 4"(W) x 5-1/4"(L) including shaft. Weight 6.1 lbs. OEM Currie® motor. 24V 500W 2250 RPM electric scooter motor. Powerful four brush permanent magnet design with 100% ball bearing construction. Includes 11 tooth sprocket for 8mm (T8F) chain. 8.5mm x 10mm sprocket mounting area. Different size sprockets are available for this motor. 18" long power leads. Shaft rotation reversible by reversing power leads. Dimensions: 4-1/4" wide x 5-1/2" long excluding shaft, 6-1/2" long including shaft. Shaft is 1" long and sprocket is spaced 5/8" away from front of motor. Front and rear ends of motor have threaded mounting holes. Weight 9 lbs. Made by Unite®. 24V 500W 2500 RPM electric scooter motor. Powerful four brush permanent magnet design with 100% ball bearing construction. Includes 11 tooth sprocket for #25 chain. 8.5mm x 10mm sprocket mounting area. Different size sprockets are available for this motor. 18" long power leads. Shaft rotation reversible by reversing power leads. Dimensions: 4-1/4" wide x 5-1/2" long excluding shaft, 6-1/2" long including shaft. Shaft is 1" long and sprocket is spaced 5/8" away from front of motor. Front and rear ends of motor have threaded mounting holes. Weight 9 lbs. Made by Unite®. 24V 500W 2250 RPM electric scooter motor. Powerful four brush permanent magnet design with 100% ball bearing construction. Includes 11 tooth sprocket for #25 chain. 8.5mm x 10mm sprocket mounting area. Different size sprockets are available for this motor. 18" long power leads. Shaft rotation reversible by reversing power leads. Shaft is 1" long and sprocket is spaced 5/8" away from front of motor. Dimensions: 4-1/4" outside diameter x 5-1/4" long excluding shaft, 6-1/4" long including shaft. Mounting bracket measures 4-3/4" x 2-7/8" and has 4 holes that are spaced 4" x 2-1/4" apart. Weight 9.2 lbs. Made by Unite®. 24V 600W 2600 RPM electric scooter motor. Powerful four brush permanent magnet design with 100% ball bearing construction. 11 tooth sprocket for #25 chain. 25" long power leads with connector at end. 3 bolt mounting bracket measures 3-7/8" center to center distance between holes. Dimensions: 4"(H) x 4"(W) x 5-1/4"(L) including shaft. Weight 5.8 lbs. OEM Currie® motor. 24VDC 600W 2600 RPM electric scooter motor. Powerful four brush permanent magnet electric motor design with 100% ball bearing construction. 15 tooth freewheel sprocket for #25 chain. Shaft rotation spins counter clockwise if you are facing the shaft. 12" long power leads with connector at end. 3 bolt mounting bracket measures 3-7/8" center to center distance between holes. Dimensions: 4"(H) x 4"(W) x 5-1/4"(L) including shaft. Weight 6.1 lbs. OEM Currie® motor. 24V 600W 3200 RPM high-torque brushless 24 Volt DC electric bicycle motor. Built-in variable speed controller works with any 5k Ohm throttle or potentiometer to vary the speed of motor from full stop to full forward. Clockwise shaft rotation when facing the shaft end of the motor. 8mm OD D-shaped output shaft (8.6mm across flat spot). Shaft protrudes 1/2" from motor body. 3-bolt 114mm BCD mounting pattern. 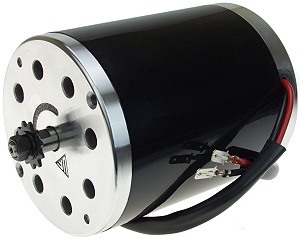 These are the OEM motors for the ElecTrec® electric bicycle which has a top speed of 18mph and a 20 mile range. Made by MAC®. ElecTrec®, Currie®, Lashout®, and Synergy® electric bicycles plus Currie® USPD Pro-Drive electric bicycle kits. 24V 650W electric bicycle, tricycle, and go kart motor with built-in planetary gear reduction transmission and cooling fan. Output shaft speed 530 RPM. Shaft diameter where sprocket seats into is 9mm x 13mm with a dual D-bore. Includes 10 tooth sprocket for #40, #41, and #420 chain (all of these chain sizes work with this motor's sprocket). Powerful four brush permanent magnet design with 100% ball bearing construction. 12 gauge power leads. Shaft rotation reversible by reversing power leads. Mounting bracket measures 5-1/2" x 4-1/2" with 4 mounting holes. Mounting holes are spaced 4" center to center across by 2-1/2" center to center across. Weight 17 lbs. Made by Unite®. Compatibility: Great choice for beach carts, beach wagons, ATVs, quads, tricycles, and quadracycles. 24V DC 750W 2600 RPM electric scooter motor. Powerful four brush permanent magnet design with 100% ball bearing construction. 11 tooth sprocket for #25 chain. Shaft rotation spins counter clockwise if you are facing the shaft. Shaft rotation is reversible by reversing power leads. 25" long power leads with two pin white connector. 3 bolt mounting bracket measures 3-7/8" center to center distance between holes. Dimensions: 4"(H) x 4"(W) x 5-1/4"(L) including shaft. Weight 6.5 lbs. OEM Currie® motor. 24VDC 750W 2600 RPM electric scooter motor. Powerful four brush permanent magnet electric motor design with 100% ball bearing construction. 15 tooth freewheel sprocket for #25 chain. Shaft rotation spins counter clockwise if you are facing the shaft. 12" long power leads with connector at end. 3 bolt mounting bracket measures 3-7/8" center to center distance between holes. Dimensions: 4"(H) x 4"(W) x 5-1/4"(L) including shaft. Weight 6.6 lbs. OEM Currie® motor. 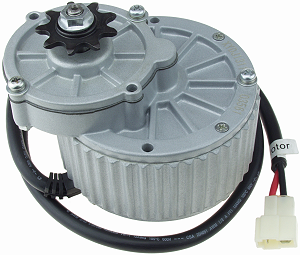 We stock a wide variety of 24 Volt DC motors for electric scooters, bicycles, go karts, mini bikes, beach carts, bar stool racers, and all other types of small electric vehicles.